In The Seven Pillars of Health, Dr. Don Colbert seven principles that when applied, enable people to walk in and enjoy optimal health. Those seven pillars are water, sleep and rest, living food, exercise, detoxification, supplements, and coping with stress. The Seven Pillars of Health will help readers learn to make healthy choices regarding their health. 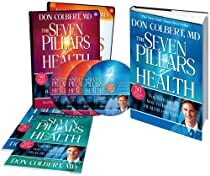 Dr. Don Colbert designed Seven Pillars 50 Day Journal for use with The Seven Pillars of Health to help readers implement the 50-day program outlined in the book. The journal features action steps for applying the daily principles, inspirational or motivational thoughts, a log for recording daily choices made regarding several of the principles as well as benefits received, and a place to record notes for doctor visits as well as the spiritual and emotional aspects of their journey. The Seven Pillars Of Health Personal Kit Workbook is an interactive blueprint for following the 50-day program outlined in The Seven Pillars of Health.